Creating a work of architectural art glass is a collaborative process. It involves the ideas of the client, and the inspiration, creativity and skill of the artist. So, we need to talk. I'd like to meet with you, have you look at my portfolio, and tell me what you like or dislike. 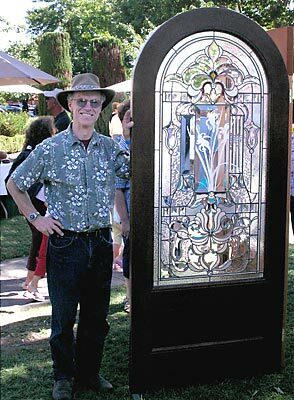 We'll discuss your ideas about imagery, color, texture and how best to interpret them in art glass. We'll decide how the artwork will fit into the overall environment at the site. Frequently, issues of view and privacy are particularly important. We'll discuss how the art glass will resolve them. Getting a good sense of the site is essential and having our meeting there is always helpful to the discussion. If that’s not possible, I can gain much information from viewing a video or photos. Using your information, I'll create a drawing to scale that simulates, as nearly as possible, the look of the actual artwork. In my design presentation, along with this drawing, I'll include glass samples and any other materials necessary to give a clear idea of the look of the finished artwork. If, for any reason, this design does not hit the mark for you, I'll either revise it, or work up a new idea. You must feel satisfied. Once the design work has been approved the project goes into my fabrication schedule. I make every effort to have the artwork ready when it is needed. Upon completion of the artwork, I'll either install the work myself or deliver it to you.